Leaves for Trees: At what point will we call ourselves Americans? As I was thinking about my Irish roots in preparation for St. Patrick's Day I was feeling a little down. I know I'm of Irish descent, but as I look at my tree I see that my most recent Irish ancestor immigrated prior to 1770. Can I really call myself Irish if the link is from 250+ years ago? I've always felt a strong tie to Ireland so I will continue to drink to good health on St. Patrick's Day and listen to my Irish music whenever I feel like it. A map of North America, by J. Palairet, with considerable alterations & improvements. from d'Anville, Mitchell & Bellin, by L. Delarochette. Created/published in London, Printed for John Bowles, 1765. 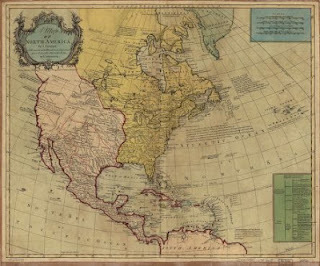 American Memory Map Collection, Library of Congress. But that brought up another thought. At what point will we just say we are Americans? Not Irish-Americans, German-Americans, etc., but just plain American? I'm not suggesting that we forget where our ancestors came from, but will there be a time in the future where people born in the United States will just say "I'm American?" I don't know that I ever see that happening. It is a unique trait about our country that it was built upon the backs of immigrants, which includes all the bad and good things that have happened throughout our history. I don't believe that we will ever let that go, or that we should. We are proud of our Irish ancestors in the American Revolution, our Italian ancestors in the Industrial Revolution and every other culture that participated in the advancement of our country. Our other unique trait is that we are fiercely American. Isn't it interesting that we continue to claim our ancestors' heritage, yet trump that with the heritage of our birth country? We get our cake and eat it, too. That being said I will continue to be a German-Irish-English-French American eating my Reuben and crusty bread with cheese, drinking my pilsner and wine and finishing off with shortbread all while wearing the red, white and blue. I've often wondered the same thing, Heather. You expressed it so well! I kind of think of myself as an American mutt with a strong German base and a streak of English, along with a wild card I haven't quite identified yet. So I'll gladly join you for your American potluck. I also call myself a mutt! I'm glad this thought resonated with you as well! Until I started working on my family tree a few years ago, we didn't have much idea where we came from, or how long we'd been in America, so I've never really been able to identify with any other nationality. Now that I've discovered that nearly ever branch of my tree has been on American soil since long before the revolution, it has just reinforced that. Yes, I have some English, Irish and German roots, but I am an American. @mamafoxof3- I'm like you, I call myself an American. 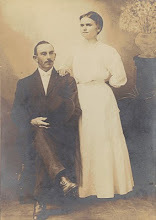 In my family we are so far removed from our immigrant ancestor that we have no traditions attached to other countries. All of our traditions are uniquely American and I wouldn't have it any other way. @Dara- That is another good point. It would be difficult to say any one culture has more influence over your personality when you have so many! We are very lucky to be able to celebrate all of them. It's cliche, but perhaps we have drilled down to what an American is: a conglameration of culture. As the saying goes: "indivisible, with liberty and justice for all." Perhaps you can not define American without acknowledging all of the cultures that came together in this place. The cool part is that it continues to change with new immigrants from new parts of the world. What a glorius place! I've always considered myself an American first and foremost. I think of myself as an American of Irish descent. My grandparents were from Ireland.